Remember all those happy, lovey, sweet words I said about magic being in the air…and how fall was wonderful and I loved it….yea….I TAKE IT ALL BACK! It’s Saturday, October 6th, it’s supposedly “OFFICIALLY FALL” and the high is 92 degrees with max humidity! Ummmm….someone needs to call mother nature and tell her to stop NAPPING ON THE JOB and GET WITH IT cause this is totally NUTS!!!! 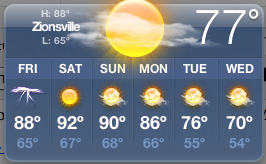 Oh…and don’t worry…I just checked it again and now the high tomorrow is 93 and the high on Monday is 92!! HAPPY FALL!! Ha! I left for Vegas sunday a.m. and it was 90 in Minneapolis, and only 60 in Vegas!! Upon returning to MSP on Wed. night it had cooled off to a chilly 40. What IS up with this crazy fall weather in the midwest?!? !